Citation is not yet available for this publication from Molecular Ecology. It will become available shortly after the publication appears. The ways that plant-feeding insects have diversified is central to our understanding of terrestrial ecosystems. Obligate nursery pollination mutualisms provide highly relevant model systems of how plants and their insect associates have diversified and the over 800 species of fig trees (Ficus) allow comparative studies. Fig trees can have one or more pollinating fig wasp species (Agaonidae) that breed within their figs, but factors influencing their number remain to be established. In some widely distributed fig trees, the plants form populations isolated by large swathes of sea, and the different populations are pollinated by different wasp species. 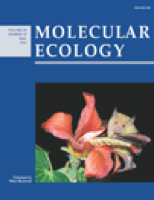 Other Ficus species with continuous distributions may present genetic signatures of isolation by distance, suggesting more limited pollinator dispersal, which may also facilitate pollinator speciation. We tested the hypothesis that Ficus hirta, a species for which preliminary data showed genetic isolation by distance, would support numerous pollinator species across its range. Our results show that across its range Ficus hirta displays clinal genetic variation and is pollinated by nine parapatric species of Valisia. This is the highest number of pollinators reported to date for any Ficus species and it is the first demonstration of the occurrence of parapatric pollinator species on a fig host displaying continuous genetic structure. Future comparative studies across Ficus species should be able to establish the plant traits that have driven the evolution of pollinator dispersal behaviour, pollinator speciation and host plant spatial genetic structure.